Virus makers are constantly finding new ways of compromising your computer so it's important to update the software that you have installed. New versions of software programs are usually safer to use and have been patched to prevent intruders from hijacking them for nefarious purposes. But with dozens and even hundreds of programs installed on a typical PC, how do you go about making sure that outdated and insecure software has been upgraded? 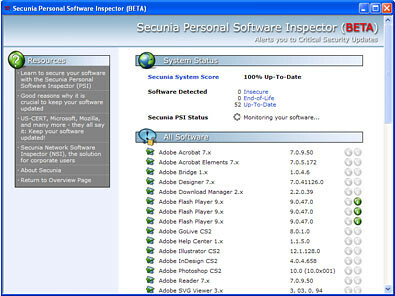 Try using the free Secunia Personal Software Inspector (PSI), which scans your computer for software and classifies it as either Insecure, End-of-Life, or Up-to-Date. The best part is that the inspector provides you with direct download links to updated versions of insecure and end-of-life programs. The Secunia PSI checks the meta-data of executable and library files (.exe, .dll, and .ocx files) to determine the version numbers of the programs you have installed. Then it contacts the Secunia servers to see if the software is up-to-date.